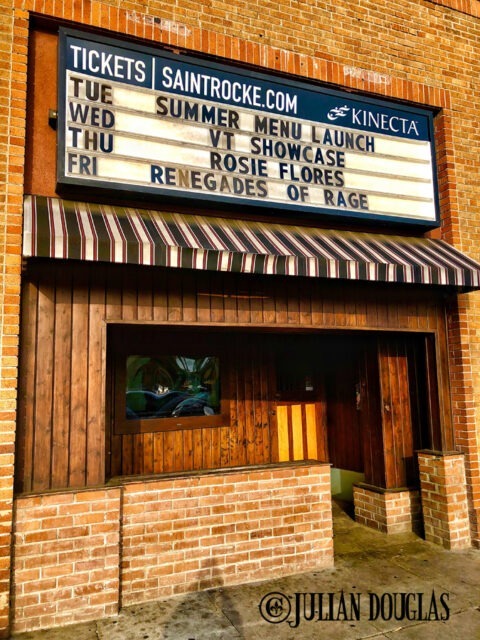 Saint Rocke in Hermosa Beach has won the title of Best Live Music Venue in the South Bay by The Easy Reader for many years, including the past 6 years in a row. 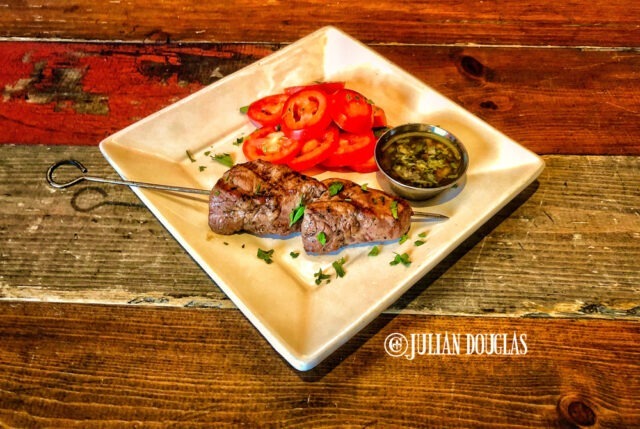 The Meat Spiedini’s, aka Beef Filet skewers, are a big hit since their debut on the Summer Menu. If it’s a legendary national act or popular tribute act, everyone’s become accustomed to knowing they’ll find it Saint Rocke. That said, one of the few accolades that have alluded to them has been a reputation for great food, well, that’s about to change. 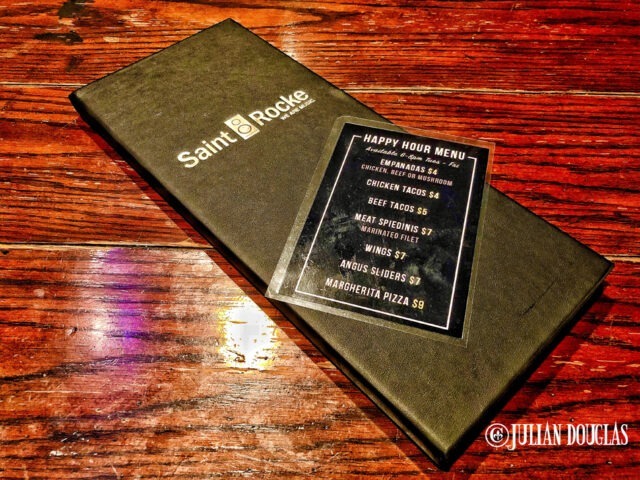 Saint Rocke is finally serving up more than great music at their venue. 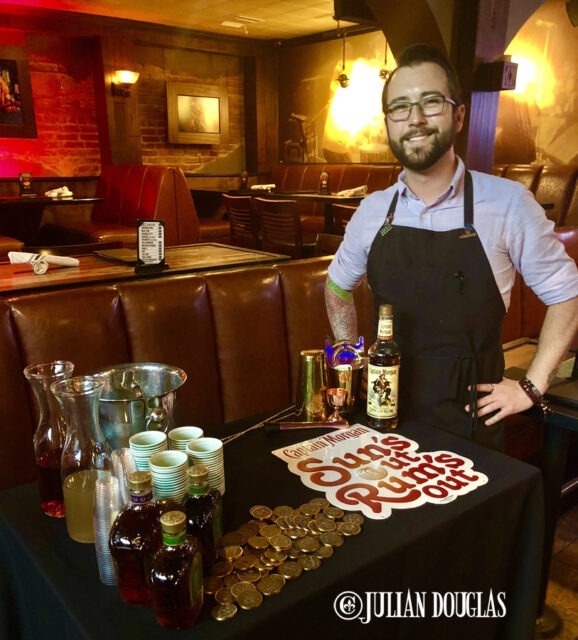 Captain Morgan had one of their reps at the Summer Menu Release showing off new cocktails to enjoy. Not too long ago, club veteran Hugo Tellez was promoted to General Manager. 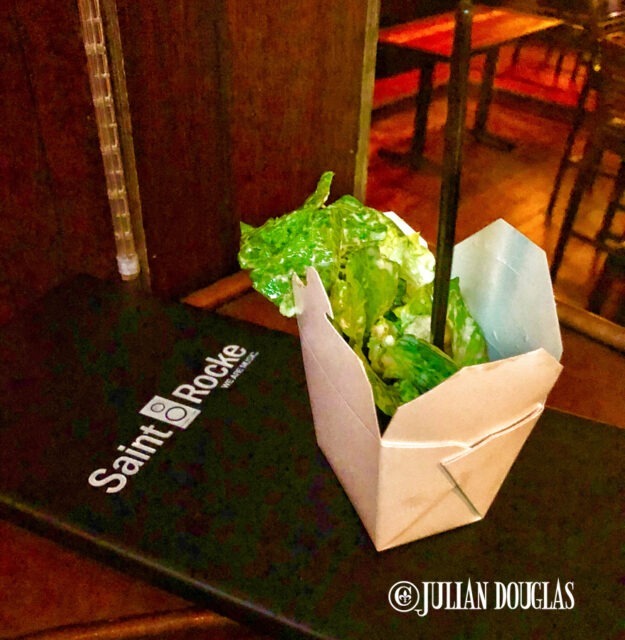 A true feel-good story as Hugo started as a bar back at Saint Rocke nine years ago. Over time he worked hard and climbed the ranks, from bartender to manager and to now General Manager. He has a real determination for the success of the club and one of his projects he hoped to accomplish was revamping the menu. 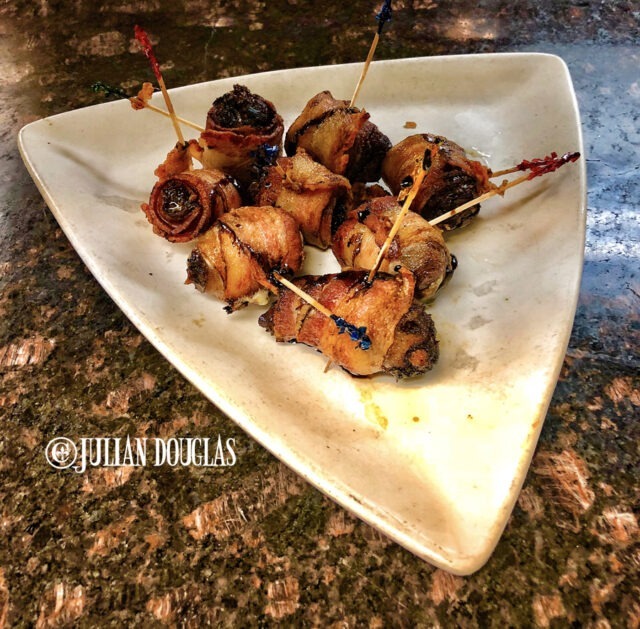 Needless to say, when the new Gorgonzola stuffed, Bacon wrapped Dates came out at the Launch Party, they went quick! The timing was perfect as owner Allen Sanford had just brought in a new Chef, Miguel Aliaga. Hugo sat down with Chef Miguel and the two worked on ideas to steer away from the reputation of typically frozen bar bites to actual fresh and tasty items that patrons can easily enjoy while waiting on or watching a live show. The Summer Menu Launch Party was on and the long line of people that had been outside was now inside enjoying the food. 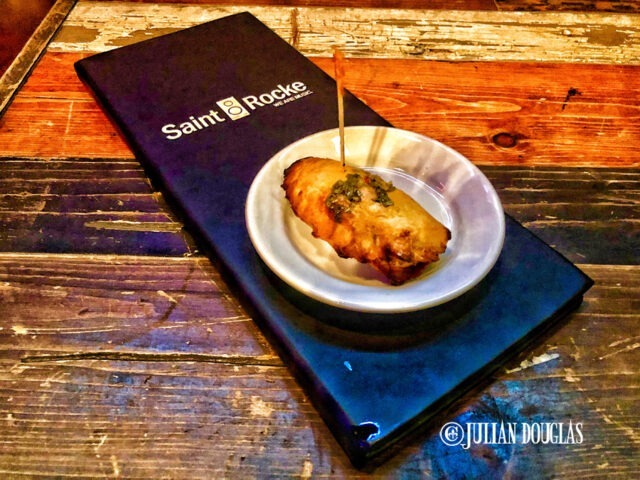 Just recently, their hard work paid off and Saint Rocke held a private New Summer Menu Release Party. They had a couple of their alcohol vendors come by to show off some of their new signature cocktails along with some of the bar staff pouring one after another. The servers were slammed bringing out samples of all the new dishes for the lucky guests to try, with local entertainment providing some classic music to dine by. The event was a success but even more, the food was a huge hit! 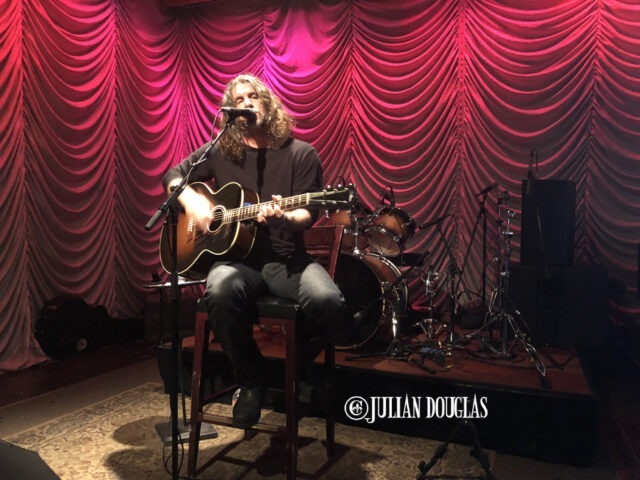 A South Bay favorite, Kevin Sousa had the place rocking just enough while patrons were able to talk and enjoy all the new selections at the Launch Party. Some of the new menu items that were a big hit included a Grilled Sausages plate, Homemade Empanadas (Beef, Chicken or Mushroom), Meat Spiedini’s (Beef Filet), Stuffed Dates, Margherita & BBQ Pizzas and a Fried Chicken Sandwich. The Fried Chicken Sandwich was a hit and has been ever since the Party. They even ramped up some of their existing selections, such as the Beef & Chicken Street Tacos, Rocke Burger, Angus Beef Sliders and the Caesar Salad by putting Chef Miguel’s delicious new touches on them. The new Caesar Salad, as served for all the patrons at the Launch. Ask about adding Grilled Chicken for even more of a meal. Let’s not forget about those new drinks either. The Tophat Mule, Poison Apple, Roseberry Lemonade, Cucumber Martini and Captain’s Blood are some takes on signature classics like the Old Fashion and Cadillac Margarita. All the new signature drinks on display at the Summer Menu Release Party. With the launch party a success, the new menu rolled out a hit. People are ordering more food than before and more importantly, coming down earlier to enjoy a meal before a show rather than just showing up for the bands. The Empanada’s are quite popular from the night of the Launch Party and even more now. With choices of Chicken, Beef or Mushroom there’s no question why. They’ve even brought back their weeknight Happy Hour. Now every Tuesday through Friday evening from when doors open at 6:00 PM until 8:00 PM they feature great pricing on food and drinks. Including from the kitchen, for only $4.00 the Empanadas or Chicken Street Tacos and for only a buck more the Beef Street Tacos; for just $7.00 the Meat Spiedini’s, Chicken Wings or Angus Sliders and for $9.00 a whole Margherita Pizza. Plus $5.00 Draft Beers, Well Drinks & House Wine. Now you can unwind after work with some good food & drinks without spending much! The new Happy Hour menu with the great prices now! 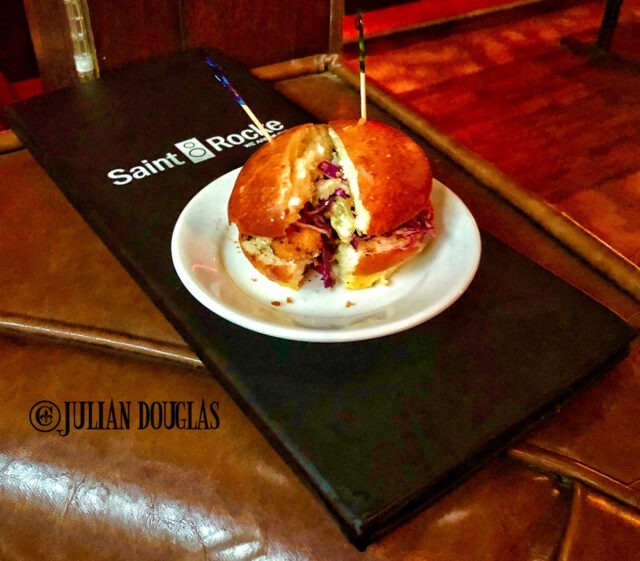 For me, it didn’t take long to find a few favorites that I seem to order every time I’m at Saint Rocke. My two go-to by far though seems to be the Meat Spiedini’s and the Grilled Sausages. The Meat Spiedini’s ordered with tomatoes for a healthy version. The Spiedini’s are two large pieces of Beef Filet, tender and juicy, prepared to order. 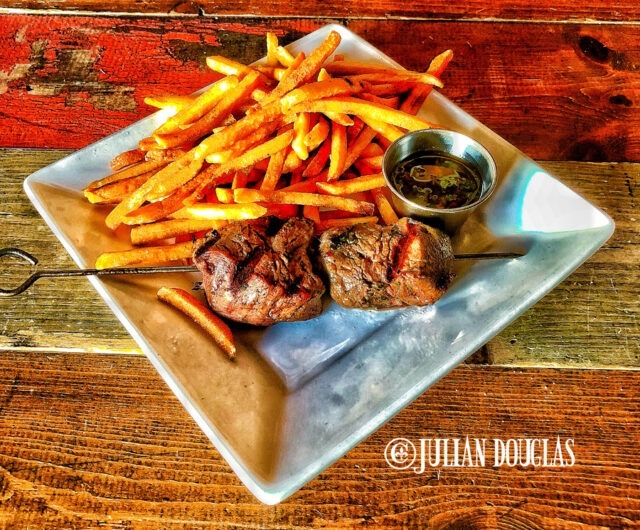 They’re served with a tasty Chimichurri sauce and an order of Fries. Though on my current health kick I’ve been ordering it with sliced tomatoes instead of the Fries which also gives it a nice hint of acid. 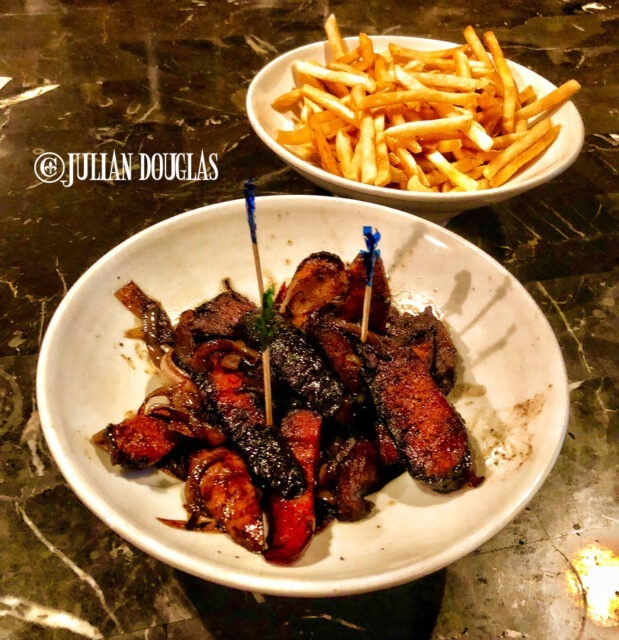 The Grilled Sausages are quite flavorful and a side of crispy fries to soak up all that molasses sauce at the bottom, works great. The Grilled Sausages simply are just that, assorted sausages, grilled for that great flavor, then mixed with onions and molasses. At the Summer Menu Launch party, one of the hits was the Lamb Filet – Meat Spiedini’s and became a Limited Time Special. Every once in a while they’ll feature a Special that day or weekend so be sure to ask. 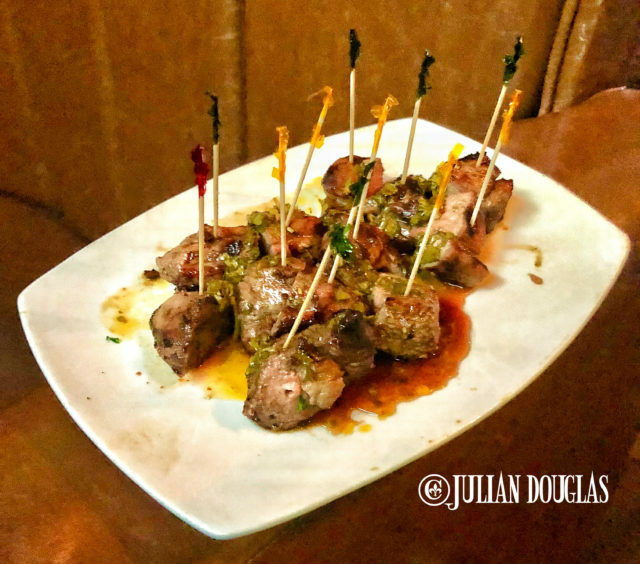 My favorite since the debut of the new menu has been the Lamb Filet, then to my surprise, since I stay away from gluten, they featured a gluten-free pizza crust that was actually one of the best I’ve had. I’m hoping that becomes a monthly special. A rare but great treat was their Gluten-Free pizza. 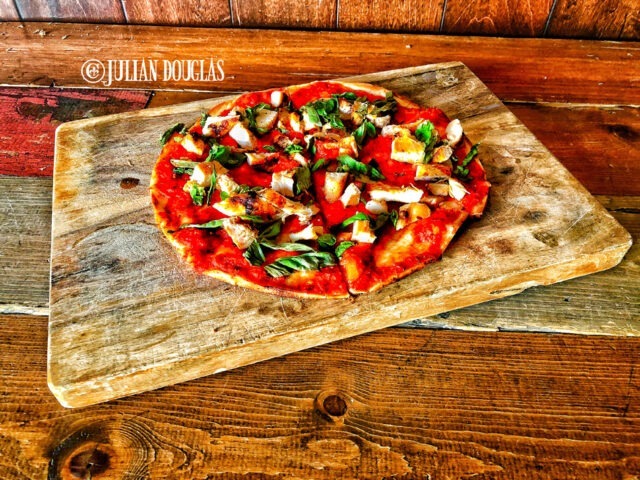 I ordered mine without cheese (darn food restrictions) and with the fresh sauce, basil and grilled chicken breast… it was incredible. I spend a lot of time at Saint Rocke, more importantly so do many people I know. Like many music clubs, this one had that stigma of the ol’ potato skins & jalapeño poppers, most never bothered to order food while there. Not only have things changed with Hugo and Chef Miguel at the helm, but they also continue to get even better. Give their new menu a try. Arrive early, relax and enjoy dinner or if running late to a show, ask for a menu while catching your favorite band. 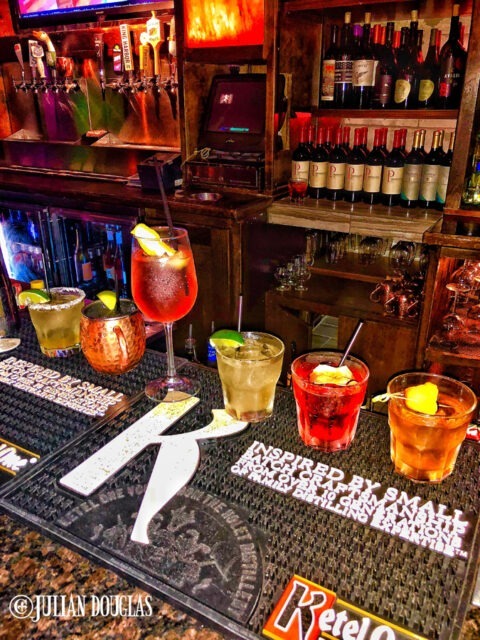 See what one of the great staff there have to suggest and add to your night out for an even better experience! 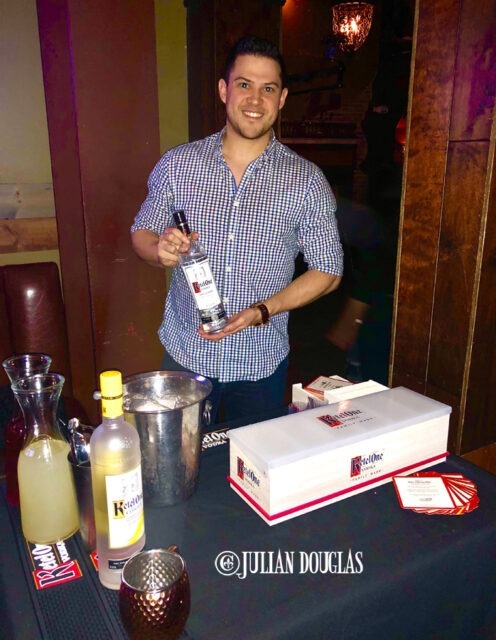 The Ketel One rep in the house for the Launch Party serving up all the Ketel Cocktails.